There’s a road that runs dead straight across the Central Kalahari in Botswana. It isn’t just that someone was feeling lazy and drew a rulered line across a map while thinking ‘that’s about right, it’ll do’; I checked my Track My Safari log and there was an unrelentingly straight road showing up day after day. Since the maps for each day of driving are created using GPS technology, it’s an accurate recording of the route I took. The road consists of deep, soft sand, and trees and bushes press into the narrow gap carved out for vehicles. That makes for tough driving, with even the hardiest trucks fishtailing erratically while lurching forwards on spongy, deflated tyres. After you’ve pushed through about ten kilometres of this and taken over an hour to do so, your mind starts to play tricks: I became convinced we were going uphill. Logic – that irritating demon embodied in this instance by my partner – dictated that we were not. The argument would have raged for hours were it not for an altimeter sitting stolidly on the dashboard, the electronic display showing an unchanging 990 metres above sea-level. That should have settled it, had I not inwardly believed the dratted thing was malfunctioning just to spite me. People once set out across Africa in nothing more hardy than an ox-wagon: the Voortrekkers used them heading north from the Cape in the 1830s. Armed with little more than a Bible and a tenuous grasp of the principles of navigating by the stars, those early Afrikaners were a hardy bunch. It’s easy to romanticise such expeditions, but frankly I’m fairly sure they’d have welcomed the safari-enhancing technology available today. Now, few overlanders will set off without recourse to fridges, freezers, and a whole battery of devices such as cameras and phones that require regular charging; you can even settle down with a sundowner to watch the football if you have a satellite TV and a skewed set of priorities. And there are some great apps to improve your trip, too. Tracks4Africa, the finest of the GPS map systems available for use on the continent, is a must for anyone on a self-drive trip. Compiled almost entirely of user experiences uploaded to a website that constantly updates the software, there are certainly problems with it from time to time but, on the whole, it will keep you from getting totally lost – albeit while sending you along unnecessarily complex routes when driving in towns. One of my favourite apps takes full advantage of the famously vast African skies: at night I can sit outside and identify the myriad stars blinking down at me, and find planets and galaxies and constellations with a few quick taps in the free GoSkyWatch app. Stellar satisfaction indeed. Whether or not you’re a dedicated twitcher, you can’t help but be mesmerised by the kaleidoscope of colours the African birds proudly display. The stunning Lilac-Breasted Roller is widely regarded as the prettiest, and the bright blue Wooded Kingfisher’s call becomes a familiar, friendly sound within days of arriving (whereas the screech of the Black Bellied Koran acting as a self-appointed lookout rapidly becomes infuriating). Roberts Bird Guide is by far the best book for identifying birds in Southern Africa, and it’s now available as a multimedia app; it has the entertaining feature of playing bird calls, enabling you to engage in conversation with nearby birds and keep them around for precious extra moments while the photographers in your group snap away. For all the excitement that safaris involve, there’s a surprising amount of downtime. Animals tend to hide in the heat of the day, and although there’s nothing quite like a sundowner looking out at a typically hypnotic African vista, there are still hours of darkness before you’ll want to retire for the night. If you’re doing a trip in your own 4×4 then space will always be at a premium and – much as I love the feel and smell and intimacy of books – a Kindle or the equivalent app will be a Godsend. When transfixed by a leopard draped across the bough of a tree, it’s easy to become convinced that the moment is unforgettable. But after witnessing a multitude of “unforgettables”; in the course of a few days, they have a tendency to get mixed up: was it during this sundowner we met that nice couple from Switzerland, and was it by that riverbed we saw the cheetah stalking the impala? Track My Safari neatly captures all the best moments of a safari with photos taken within the app being marked by a waypoint on a downloadable map – in addition to sundowner signifiers, Big 5 markers, and the ability to jot down notes at the end of each day. The individuality of all your game drives are captured in separate maps that are perfect for bringing back memories once you’ve returned to your office cubicle. These days, if there’s a gap there’s an app. There are countless game viewing apps you can download to help you learn to distinguish between all the buck you’ll encounter on safari, and the Africa: Live app operates throughout the continent allowing people to instantly share their sightings on an interactive map. But spending all day peering at your screen, tracking down an animal after a tip off; from an anonymous stranger, seems to me to be going too far. 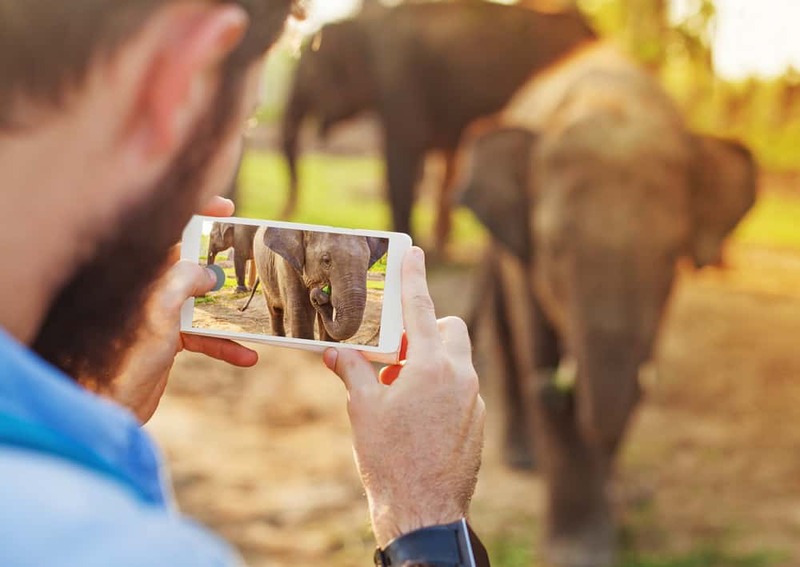 While technology can certainly enhance a safari experience, it shouldn’t control it. Maybe use it to capture memories – or end an altitude-oriented argument – but don’t become a slave to it. No gadget will ever replace the feel of Africa and that is, after all, the main reason for going there in the first place.